It sounds like a bad sci-fi movie or an Orwellian Novel about a government gone mad with power; unfortunately, it could be our very near future: Robocops and drones keeping tabs on everyone. 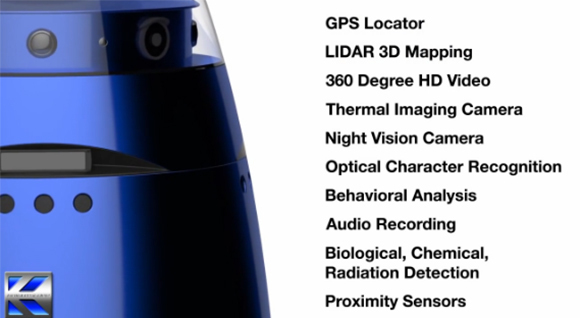 A Silicon Valley company called Knightscope is currently testing a prototype robot that they say will help patrol the streets of America – monitoring the public and using analytical data to “predict future crimes.” The Knightscope K5 is a five-foot-tall autonomous robot that looks closer to R2-D2 than it does Robocop, but this robot is no Hollywood creation, it’s the real deal. According to the company, the new Robocop is built to “Predict and Prevent crime.” William Santana Li, CEO of Knightscope, says the robot is, “everything that’s great about Silicon Valley, its robotics, big data, predictive analytics, its sensors,” and it could be patrolling your neighborhood very soon. The company not only hopes to use these robots to track your every move, but they’re seeking to combine them with social media platforms so everyone can become a mini-spy for the police state. Data collected through these sensors is processed through our predictive analytics engine, combined with existing business, government and crowdsourced social data sets, and subsequently assigned an alert level that determines when the community and the authorities should be notified of a concern. If an alert is pushed, the K5 machine will turn on all of its sensors to allow the entire community to review everything and also contribute important real-time information. Our approach alleviates any privacy concerns, engages the community on a social level to effectively crowdsource security, and provides an important feedback loop to the prediction engine. Silicon Valley is the Big Brother Surveillance State we all feared. Over the years, Silicon Valley companies have generated a treasure trove of information. These companies control massive databases filled with private information on everyone who has ever spent any time on the internet. Things you would be reluctant to tell even your doctor, are sitting somewhere in a database profile because you searched for it online. I don’t think people realize how much information these companies, and the government, really have. Between the information you share on social media, to the pictures you upload from your smart phones, they pretty much have it all. Your face, your habits, the things you buy, and anything you’ve ever done online is sitting somewhere inside a massive database just waiting to be abused. We used to fear the Big Brother surveillance state, but for some reason people looked the other way when these private companies started to build detailed profiles on every person in the world. Now, there’s really no turning back. These companies are actively pushing for the surveillance of everybody, and every square inch of the world. Is this video below, the company shows how it’s Robot can be combined with drone technology to create an atmosphere where no one can hide. Your thinking to high tech for this barrel of of fun. Sand or pea gravel strewn around will more than likely slow them down. Then you just have to worry about the drone accomplices. I thought the government would take a more intelligent step in spying on its people other than this. But I guess not. Looks like the gov lost its touch! ummm. Curbs. Stairs. Grass. Guess this wee fella won’t move far in the real world..